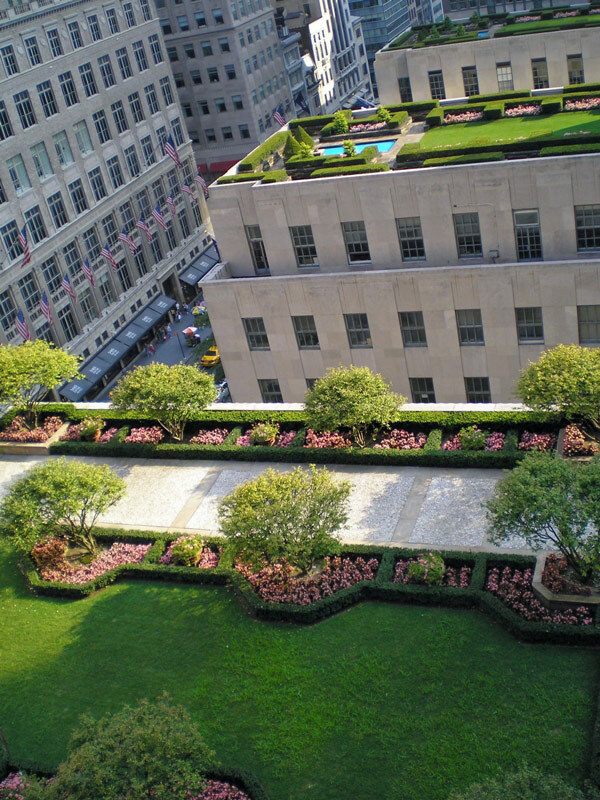 Rooftop gardens provide contact with nature in places where that has become a bit of a luxury, such as in big crowded cities. According to a study by the University of Exeter Medical School, having regular contact with nature and green spaces in urban areas can help to keep you mentally healthy and aid with your overall happiness. In addition, because of the decreased pollution levels and the increase in water and air quality provided by rooftops, demands for health care and stress could be reduced. Less stress levels also means happier and more productive employees, and therefore easier employee recruitment for companies. Rooftop gardens contribute to the reduction and filtering of polluted air particles and gases, not only through the plants and the photosynthesis process, but also by deposition in the growing space. Green roofs may also help reduce the distribution of dust in the air and the production of smog, which leads to decreasing greenhouse emissions in urban areas. It is important to note, however, that one green roof in a city may not have a huge effect all on its own, but larger numbers of roofs in a city could have a noticeably positive impact. 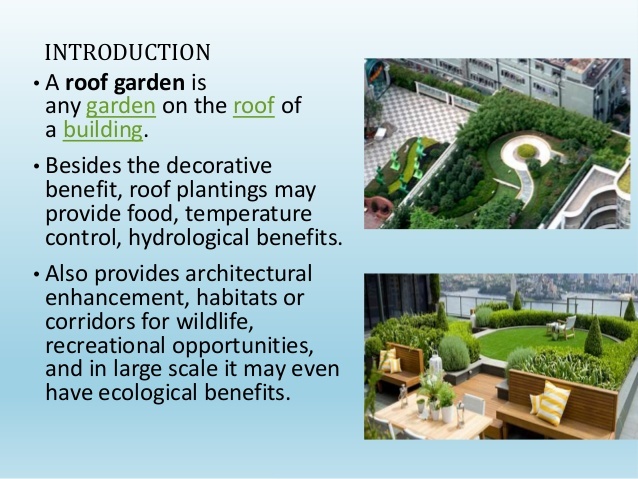 Rooftop gardens could potentially contribute to a decrease in waste, due to helping the materials and technologies used in the building to last longer. This can include the waterproofing membranes used on the roof, and the decreased use of heating, ventilation, and air conditioning systems. Rain is free water and energy we get from the environment, and rooftop gardens are perfect to make the most of it. Plants on green roofs use the rain immediately, and sometimes the excess is stored so that it can be used later. In summer, rooftop gardens can retain up to 80% of rainfall while in winter this can be up to 40%. After the water is used it it is returned to the atmosphere through transpiration and evaporation. Plants in rooftops not only retain rainwater, but also help to moderate its temperature, acting as natural filters for any water that runs off the building. The chances of water run off, however, is also decreased by rooftop gardens, reducing the impact this may have to the city and the possibility of local flooding. Probably one of the most impressive and important benefits of rooftop gardens is how they positively affect the Urban Heat Island effect. The UHI concept is based on the increased temperature levels found in pretty much all urban areas. Because the sun warms up concrete faster than it does plants and trees, and because concrete is more abundant in urban areas, the city becomes a big hot-aired area (heat island) all year round. This makes cities extremely hot in summer, leading to an increased use of air conditioners and other cooling technologies. This effect decreases with the more green spaces we incorporate in a city. Through the daily evaporation cycle, plants are able to cool down entire cities, reducing the UHI effect. Moreover, the plants themselves will be covering what would have otherwise been a concrete rooftop, one of the main causes of UHI itself. 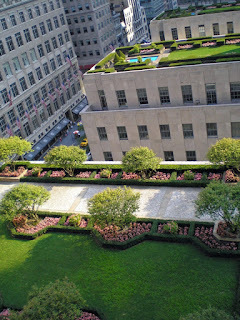 Rooftop gardens can also lead to less and more effective use of energy. They provide great insulation, retaining heat in winter and keeping temperatures cool in summer. This translates into less air conditioning systems being put to work in summer and less heating used in winter, hence the conservation of energy and subsequently money. In fact, a study published by the National Research Council of Canada concluded that rooftop gardens can actually modify temperature fluctuations, moderate heat flow through the roof, and reduce the energy demand for air conditioning, especially in the hotter seasons of spring and summer. With rooftop gardens comes another environmentally friendly and booming initiative – urban agriculture. This involves using green roofs as miniature farms that actually produce fresh food. The insulation provided by rooftop gardens not only can be applied to temperatures but also to noise. The combination of soil and plants can help to absorb, reflect, or deflect sound waves, providing the building with excellent noise reduction, particularly for low frequency sounds. This could be greatly beneficial in decreasing noise pollution in busy cities or areas that are located near airports or underneath flight paths. Other than the different types of bushes, trees, plants, and invertebrates rooftop gardens can harvest, they can also be a perfect habitat for many birds, and act as a stopover for migrating species, allowing two different type of these to come into contact.